The National Football League is generally regarded as "America's Game" due to the ascendency of the league as America's most popular sport. The annual rite of the Super Bowl excites Oregonian's as much as any other Americans, but Oregon has no NFL team to support. This is particulary noticeable since Oregon has had seven professional outdoor teams, hosted over thirty NFL,AFL,AAFC and CFL exhibition games and had three arena football teams. Early on it seemed Oregon was on a predictable trajectory to having an NFL franchise, but a number of things went wrong along the way. Oregon like other states that eventually had NFL franchises began the journey to pro football with the development of major college football followed by adult amateur football or semipro teams followed by minor pro football teams before ultimately being awarded an NFL franchise. Although NFL history was made in Portland during the 1950s, Oregon's little known pro football history is often overlooked and offers keys to understanding why the state is prime for an NFL franchise. The evolution toward pro football began in 1893 and 1894 when Oregon State University, and the University of Oregon respectively began to play organized football. Despite the two major colleges bringing big time football to the state it was not until January 1, 1894 when the Multnomah Amateur Athletic Club played in a much anticipated game against Stanford at Portland's Multnomah field that a giant step toward pro football had been taken. The game was regarded as the greatest sporting event in the Pacific Northwest up to that time. The Multnomah Amateur Athletic Club team lost 18 to 0 and was coached by the famous William Walter "Pudge" Heffelfinger who, according to the Pro Football Hall of Fame, was the first documented professional football player. Oregon's first professional football game was held February 3, 1935 at Multnomah civic stadium, and was organized by the Portland Rose Festival Association as a fundraiser. The game matched the reigning NFL world champion New York Giants against a Pacific Coast All-Star team consisting of nine players with prior year experience with the NFL's Chicago Cardinals and an assortment of former college players with west coast collegiate roots including the Ducks and Beavers. To the delight of some 12,000 fans the Pacific Coast All-Stars defeated the favored Giants 9 to 0. This was to be the promising beginning of exhibition professional football games in Portland. The 1930's saw a boom in fledgling pro football leagues based in Calfornia and growing Oregon connections to the NFL as former Oregon collegians played in the league. Former Oregon State University head coach Paul Schissler served as head coach of the NFL's Chicago Cardinals and Brooklyn Dodgers. While working for the L.A. Times he helped start the NFL's annual Pro Bowl. Former University of Oregon head coach John McEwan also held the head coaching job with the NFL's Chicago Cardinals during the 1930s. Despite Paul Schissler's role in developing the growing presence of professional football in California when he formed the 1936 California Pro Football League, and in the 1940s when he coached in the Pacific Coast Pro Football League the pro game had yet to place a franchise in Oregon. Throughout all of this pro football activity in California, Oregon was still waiting for an opportunity to have a professional football team to call its own. In 1942, Oregon inched closer to professional football with the formation of the Northwest War Industries Football League. The league was an adult amateur league or more commonly a semipro league that had the Portland Boilermakers as a franchise. Although the express goal of the league was to donate 52% of its profits to programs assisting servicemen some questioned the amateur status of college players who competed with pros and ex-pros. The Portland Boilermakers featured local ex-NFL players Joe Wendlick and Bill Morgan among others. Oregon was moving toward true pro football with players paid to play and teams organized for profit. 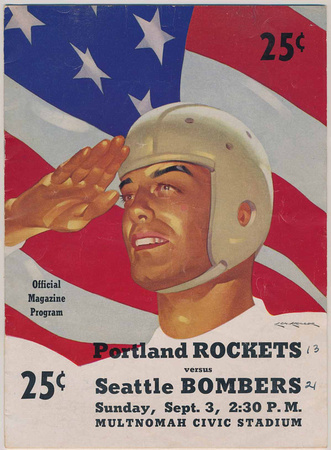 By 1944, the Northwest War Industries League gave way to a new fully professional version of the American Football League that included Oregon's first pro football team, the Portland Rockets. This latest version of the American Football League was organized by Bill Freelove, owner of the Los Angeles Mustangs of the Pacific Coast Professional Football League. In addition to Portland the league included the Seattle Bombers, San Diego Gunners, Los Angeles Wildcats, Los Angeles Mustangs,Hollywood Rangers, San Francisco Clippers, and the Oakland Hornets. Portland's home games were played at Multnomah civic stadium with the Rockets going three and six in the league's only season. The league folded for many reasons that include the weak war-time economy, competition from the Pacific Coast Professional Football League and NFL exhibition games that were played in California. played the Chicago Rockets to a 14 to 14 tie. The All-American Football Conference's San Francisco 49-ers, Cleveland Browns and Baltimore Colts survived the league's demise and joined the NFL in 1950. During the 1950s Oregon was in the NFL spotlight when league history was made at Multnomah civic stadium in a preseason exhibition game between the Los Angeles Rams and the New York Giants. The game was organized by Portland sports promoter Harry Glickman and ended with the NFL's first sudden death overtime game in favor of the Rams 23 to 17 before just over 22,000 fans. The Rams' roster featured former University of Oregon stars Norm VanBrocklin and Woodley Lewis. The 1960s was a decade in which Oregon attracted all levels of pro football interest like a magnet. Some of this interest materialized into professional teams locating in the state, and other opportunities were missed. The Dallas Cowboys chose Pacific University in Forest Grove in 1960 for their first ever training camp that included former University of Oregon stars Woodley Lewis and Jack Patera. The same year they lost 49 to 14 to the Rams in a preseason exhibition game played at historic Pendleton Round-Up stadium. "America's team" can trace some its roots to Oregon. In 1966, the NFL and the rival American Football League agreed to end their struggle for supremacy and merge in 1970. Opportunities for Oregon to have a major professional football team were never better. NFL commissioner Pete Rozelle announced that Portland and Seattle were target cities for expansion while American Football League commissioner Al Davis wanted the Oakland Raiders to relocate to Portland or Seattle. Legendary Oregonian sportswriter L.H. Gregory wrote a 1967 article in which he bemoaned the fact that Portland's civic and business leaders turned down a free opportunity to have the Raiders franchise relocate to Portland. Portland missed another opportunity to attract an NFL franchise in 1964 when voters narrowly voted down a $25 million bond measure that would have resulted in the construction of the state of the art Delta Dome that would have seated 45,000 spectators in what was to have been the largest domed sports facility in the world at that time. The only committment to a sports facility that Portland civic leaders were inclined to make was when the City of Portland purchased Multnomah stadium in 1966. This situation was ripe for minor league professional football to grow in Oregon. As earlier as the 1920s adult amateur football teams continued to evolve. In 1966, the professional Pacific Football League had teams in Eugene and Portland. The Eugene Bombers and the Portland Thunderbirds kept pro football alive in Oregon, and like the other teams in the league they each had affiliations with NFL and Canadian Football League teams. The high profile Thunderbirds had their home games at Civic stadium televised live on KPTV-12 with highly respected sportscaster Jimmy Jones providing commentary. The Pacific Football League's Oregon operations would be mortally wounded by the emergence of the higher level Continental Football League that was moving west. The Eugene Bombers joined the Continental Football League in 1967 playing their home games at Bethel Park in Eugene in front of 6,000 to 8,000 enthusiastic fans. Their roster had many division I stars from Oregon colleges, the NFL and Canadian Football league. The Bombers concluded the season with six wins and seven losses, and did not return for 1968. Oregon would not have another pro football team until 1969 when the Portland Loggers were a late entry in the Continental Football League. The tumultuous start of the season caused the Loggers to settle for a relatively weak roster with many rookies. The Loggers suffered from a lack of name recognition and promotion in addition to a three win, nine loss record that did not attract more than 4,303 fans to Civic Stadium for a single game. Financial woes mounted, and the Loggers along with the remainder of the Continental Footall League ceased operations at the end of the season. Major league pro football demonstrated a renewed interest in Oregon during the 1970s. The decade opened with a preseason exhibition game at the University of Oregon's Autzen Stadium in which the San Francisco 49-ers defeated the Denver Broncos 23 to 7. The World Football League was formed in 1973 and operated through 1975 with the objective of taking American football abroad. The twelve team league was a major league consisting of top division I players and NFL veterans. The Portland Storm joined the league in 1974 and went seven wins, twelve losses and one tie while averaging about 14,000 fans per game. Storm home games were televised live from Civic stadium by KPTV-12. One of the more memorable players on the team was linebacker Marty Schottenheimer who was out with an injury so coached the linebackers and later became an outstanding head coach in the NFL. Financial woes led to missed paychecks, and IRS problems resulting in the demise of the Storm franchise after one season. The World Football League survived to play one more season in 1975 with Portland being awarded the Portland Thunder franchise. The Thunder won four and lost seven games in a tumultous season of folding franchises and financial disarray. It would be a decade in 1985 when Portland awarded the Portland Breakers franchise in the United States Football League. The ambitious league would last from 1983 to 1985 as the then most recent attempt to break the NFL monopoly over pro football. The league signed Heisman Trophy winners Herschel Walker, Mike Rozier, Doug Flutie and Archie Griffin. Other top players in the league included future Hall of Famers Reggie White, Steve Young and Jim Kelly. The Breakers were very popular in Portland and averaged just under 20,000 fans per home game at Civic stadium. Despite a six win and twelve loss record in their first only season the Breakers were the most successful major pro team in Oregon off the field. Had the rest of the league's franchise attracted fans the way the Breakers did the league would have had a much better chance of surving beyond 1985. The NFL brought its visitors presence to an end with the 1991 Seattle Seahawks vs. the Atlanta Falcons exhibition scrimmage, and the 2004 Seattle Seahawks intrasquad scrimmage in Portland. With the demise of the World League of American Football in 1992, the Canadian Football League seized an opportunity to expand into the U.S. with Portland as a potential franchise. From 1993 to 1995 the Canadian Football League had seven franchises in the U.S. Portland business leaders Harry Glickman and Peter Jacobsen organized a Canadian Football League exhibition game played at Portland's Civic stadium in 1992 in front of 15,362 excited fans. The game between the Toronto Argonuats and the Calgary Stampeders featured Doug Flutie with Calgary and Ragib "Rocket" Ismail with Tornoto. In spite of the well received 20 to 1 victory by Toronto, Oregon did not receive a Canadian Football League franchise. Arena football filled Oregon's pro football void from 1997 to 2001 beginning with the Arena Football League's Portland Forest Dragons playing at the Rose Garden for three seasons from 1997 to 1999. The Forest Dragons averaged a respectable 8,914 fans per game while winning thirteen games and losing twenty-nine before relocating to Oklahoma City. Oregon's next arena team played in 2000 as the Portland Prowlers of the Indoor Professional Football League. They were to be Oregon's most successful pro team on the field with an eleven win, five loss record that gave them the regular season league championship. The Prowlers were led by former Oregon State University and NFL quarterback Erik Wilhem when they lost 53 to 48 to the Mississippi Fire Dogs in the league championship game. Poor promotion and sparse crowds at Memorial Coliseum spelled doom for the franchise, and they did not play after 2000. The rival National Indoor Football League set its sights on Oregon, and in 2001 played its first ever game in Medford when Oregon's Southern Oregon Heat lost 27 to 21 to the Yakima Shock at the Jackson County Expo Center. The franchise was troubled on an off the field with numerous coaching changes, player turnover, and a sparse 1,200 fans per game. Heavy debt led to the demise of Oregon's last pro football team with little notice statewide. The NFL's interest in establishing another franchise in Los Angeles has been accompanied by a renewed interest in Portland as a possible franchise as well.Such an arrangement would provide for a stronger west coast NFL presence, a northwest rivalry with Seattle and an even number of teams in the league. The numerous successful NFL and major pro football exhibition games in the past demonstrate that the NFL brand sells well in Portland. The fans are ready for the NFL in Oregon.